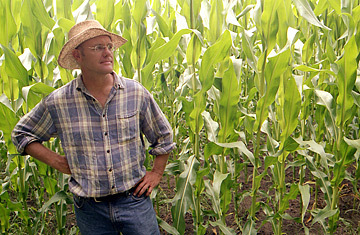 John Peterson is the subject of the new documentary "The Real Dirt on Farmer John." When Scheffler and his wife returned to the Midwest, they got some friends interested in the idea. Then, with a few dozen more people, they set out to find a farmer of their own. When they approached Peterson, he was skeptical at first. "I wasn't sure who these people were, or what the catch was," he says, "But it turned out to be a partnership that's changed my life." Shareholders in Peterson's farm have grown from some 320 in 1995 to 1,350 today  all agreeing to pay a flat annual fee of just over $500 for 20 weekly boxes of mixed produce, delivered fresh to their door. Beyond the weekly deliveries, shareholders are also invited to take an active interest in Peterson's farm, some following farm news through a weekly newsletter, others occasionally heading out to the farm to help with the harvest. In 1999, a handful of shareholders even pooled their money to buy the plot of land next to Peterson's farm, leasing it to the farmer at a reduced rate so he could expand his operations in a more sustainable way. Under the loose organizational umbrella of CSA, some 2,000 farms like Peterson's are now supplying between 250,000 and 500,000 people with fresh, local food during harvest season. It's a trend that some say is coming just in time. According to the Department of Agriculture, less than 10% of farmers are younger than 35 years old, suggesting that few young people see farming as a viable business. "As this notion of local farming gets more popular, we're starting to see the equation reach a tipping point," Peterson says. "With half a million people turning to CSA farms, it's created this new model...it's now economically viable." The biggest surge of interest in CSA operations, Peterson says, is not in the Farm Belt but in large cities, like New York, Chicago and San Francisco, where people are becoming more conscious about the food they eat and what's involved in getting that food to the dinner table. This expanding network of CSA farmers has also spurred grass-roots legislation in Washington, as hundreds of organizations have rallied around both the pending farm bill and the Food For a Healthy America Act, backed by Senator Hillary Clinton. Both bills advocate a re-thinking of the way government views domestic farming, as well as the way it subsidizes an industry that is current geared more toward exports and commodity crops (such as corn and soybean) than for community-supported agriculture. "I think what we're seeing is a consumer backlash to a centralized system that has focused one-sidedly on the production of cheap food, but food that isn't of the quality that consumers want," says Allen Hance, senior policy analyst with the Northeast Midwest Institute, a private, nonprofit, nonpartisan group that has been lobbying the Department of Agriculture for changes to the current farm bill. "Meanwhile, for farmers, there's an economic argument: Farmers who sell into local and regional markets, and sell directly, earn up to 85% of the food dollar whereas farmers who sell into the traditional supply chains get an average of 19%. When you put that together with safety concerns and the rising gas fuel prices, which can dramatically affect the very long supply chains now in place, it makes more sense than ever before to have food that's grown locally, not imported."